The Delawana Resort now has 5 beautifully renovated Beeches Suites available for the 2018 season. The Beeches Suites are a great option for our guests looking for the cottage expereince and cottage feel in a lakefront rental. Leaving the original cedar ceilings, and having direct access to Georgian Bay; these units are a prime rental for your summer getaway. 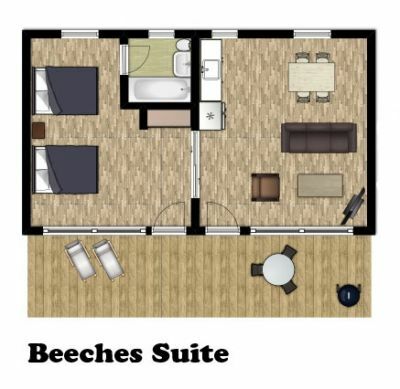 The Beeches Suites include 1 bedroom with 2 queen beds, sliding barn doors, bathroom, kitchenette, livingroom, and an intimate dining area. These newly renovated and updated units are situated near the North beach and tennis courts. They include a large deck with waterfront views, lounge chairs, and a charcoal BBQ. Now that our cottages are filling up for the months of July & August, it won't be long until these new additions get the attention they deserve this season. Starting at $525 for 2 nights in the spring/fall seasons, and $1400 for 7 nights in the summer season. Don't miss out! Book now! Delawana Resort is a self-catered resort in Muskoka, Ontario offering Cottage Rentals, Resort Suites, and Resort Rooms. Located on Georgian Bay in Honey Harbour, Muskoka. Cottage Rentals are available year-round. Delawana Resort is now accepting Seasonal reservations for 2019. Book your Seasonal Rental now before it's too late. Call us at 1-888-557-0980 to book. Get your very own private piece of the resort from May til October at a great price! To learn more about Delawana Resort's Seasonal Rentals, click here.